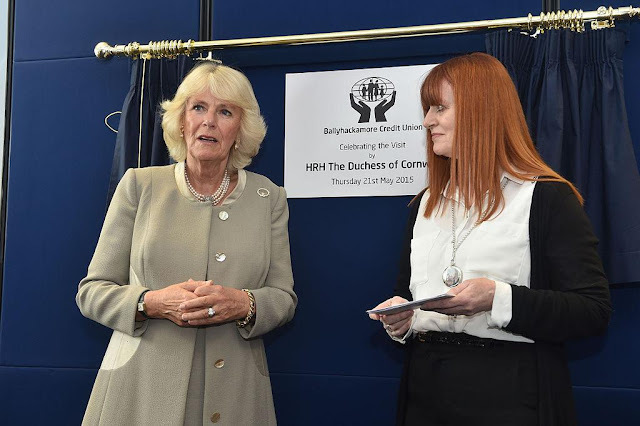 The royal family released the annual royal gift lists today, reporting those items given to them as official gifts throughout the previous year. (They do this every January: 2014, 2013, 2012.) Buckingham Palace's list includes 92 official gifts for The Queen, among them a marzipan model of the Brandenburg Gate and a black handbag from her trip to Malta. A sapphire and diamond brooch in the shape of a fern from the President of Sri Lanka. We haven't seen this one yet. A diamante brooch from The Queen's Royal Lancers. I assume this refers to the Royal Lancers Badge we saw The Queen wear in May 2015. 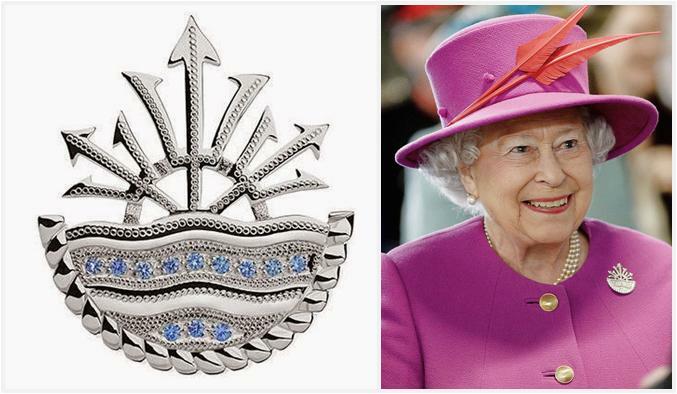 A sapphire and silver brooch from HMS Ocean, which Her Majesty has already worn. Buckingham Palace also released gifts from other family members, including a door plaque that says "Princess Sleeping" in Welsh for The Princess Royal. The Countess of Wessex cleaned up on a trip to the Czech Republic, where she was given a jeweled brooch, an evening dress, three pairs of earrings, two brooches, and a crystal pendant. You can see one of her brooches at the Countess of Wessex Blog, and she wore the evening dress to the wedding of Prince Carl Philip and Princess Sofia of Sweden. During her trip to New Zealand and Australia with The Prince of Wales, she received a pair of white gold earrings from the Mayor of Nelson, a brooch from the National President of the Royal New Zealand Returned and Services Association, a bracelet from an individual, a brooch from a “member of the public”, and a pewter ANZAC brooch from the Mayor of the City of Albany. While visiting Ireland, she was given a pair of pearl earrings from an individual and a set of silver jewelry (a pendant and chain, earrings, and a bangle) from another individual. She was also given a gold brooch from the Principal of the Claddagh National School. She promptly wore her Irish Claddagh Brooch for the next few days of the trip. Listed among The Prince of Wales' gifts from his solo trip to the Middle East is a brooch from the Crown Prince of Kuwait, and I wonder if that was intended for his wife. He also received a gentleman's wristwatch and other gifts from the Crown Prince. Since only gifts given on overseas trips are published for The Prince of Wales and his family, and there were no such trips for The Duchess of Cambridge last year, there are no jewelry additions to report for her. Prince William (and other members of the family) were given plenty of gifts for Prince George and Princess Charlotte, though. See the lists for The Prince of Wales, The Duchess of Cornwall, The Duke and Duchess of Cambridge, and Prince Harry here.